The French engineer Andre Chapelon can be claimed to be the world's greatest designer of steam locomotives. Three of the four designs he was responsible for were the most powerful locomotives for their weight ever built, and they were in a class by themselves when it came to fuel economy and efficiency. 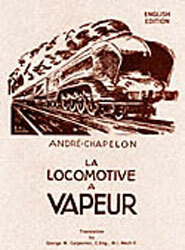 The book is translated by Mr. George Carpenter, a steam locomotive engineer and a friend of Chapelon's. He even added a fascinating chapter on the Chapelon designs which were never built, but would have been the most advanced steam locomotives ever. If you want to know what really makes a steam locomotive tick, or simply enjoy a fascinating read, this is a book you must have! Over 450 B&W photos, drawings, diagrams and charts. High quality and hard bound.